The Vitascore software has been designed for easy, efficient scoring and reporting of PSG recordings. The unique workflow management system provides structured control over the patients database and various steps in the route of your study. The Workflow-Management system is designed to give you full control on the various steps in the route of a study through the sleep lab. View, browse, annotate and score in the revolutionary multi time base environment. Speed up your scoring and sleep annotation, and jump to interesting points in time with extraordinary ease of use. Create your own screen templates to provide optimal convenience by simply adding more time-bases with any channel data you require. Using the multiple time-synchronized windows in combination with the robust automatic pre-analysis, provides certainly a time-saving and efficient way of scoring and staging. 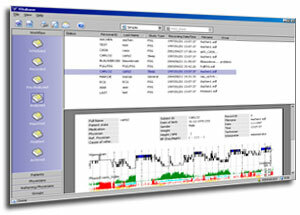 Manual annotation or correction of pre-detected events is done efficiently with a simple mouse click. With the trend curves over 8 hours in front of you, a manual re-score of sleep can be accelerated substantially (for instance by skipping stages 2, 3 and 4). The possibility of showing additional quantitative traces such as heart rate, pulse-transition time, continuous phase angle between chest and abdomen,'ventilation'(the position-dependant calibrated SUM of chest and abdomen times the instantaneous breath rate) and the harmonic distortion of nasal pressure signal as a measure for flow limitation provide helpful insight information during scoring. All data is stored in XML databases to provide an open structure and full accessibility for both the clinical- and research- professional. Based on the Chicago 1999 recommendations, the automatic pre-analysis modules yield pre-detection of respiratory-, cardio- and PLM-events. 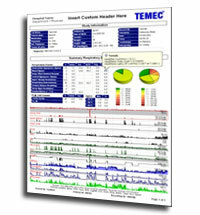 Pre-detected events are highlighted upon request and tool-tip hovers display quantification as duration and amplitude. Based on a proprietary algorithm for instantaneous frequency analysis, improved detection of artifacts, phasic events, burst activity, arousals and classification of sleep is offered. Vitareport allows you to generate one or more reports according to customized templates. 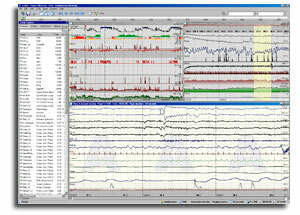 Compose your own templates via the interactive graphical editor and provide a personalized main-header section, patient info section, recording info section and numerous selectable tables containing tabulated results for all available events in combination with body position, snoring and so forth. Illustrate your reports with pie-charts and a user definable trend-curve overviews. While inspecting the report on screen, a tool-tip hover shows the mathematical expressions used for the selected cells for utmost transparency.